Taste Ontario’s growing nano-brewery trend. Nano-breweries are smaller scale craft breweries that brew in extremely small batches and serve very local areas. Ontario’s Southwest has seen growth in this trend over the past few years. 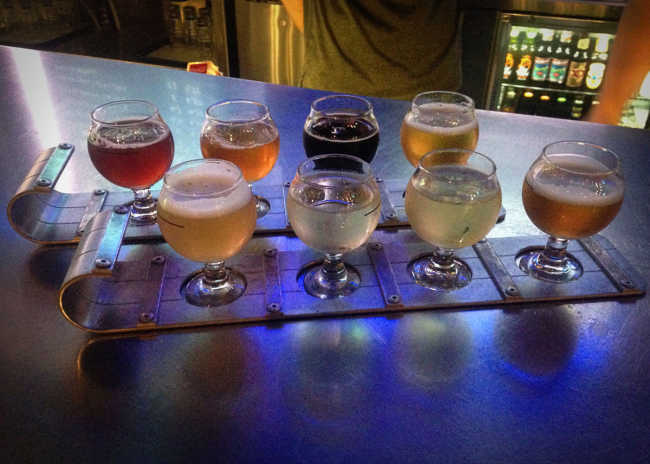 What follows is blogger, Chris Schryer&apos;s account of his trip to get to know some of the region&apos;s "half pints." Saturday dawned hot and sticky. The promise of thunderstorms was heavy in the air, despite mostly clear blue skies. I kissed my kids goodbye, dropped the Mrs to work, and headed west. Specifically, to Ontario’s Southwest. I wish I&apos;d thought to load some Petshop Boys on my phone. At Hamilton I climbed the escarpment, and headed into the beautiful agricultural lands that are part of the belt that surrounds my beloved city, and supplies us with much food, and our pristine water. My goal was to arrive in London by 11, and take in the Covent Garden Market (130 King St, London) as well as their weekly farmers&apos; market. Right on time, I found the market to be charming and familiar. 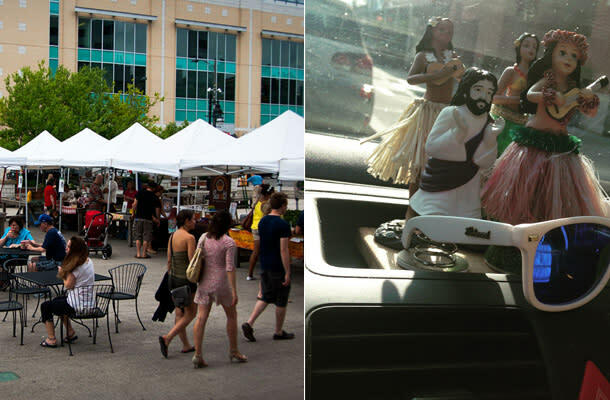 A mix of full-time vendors inside (where I bought some green coffee beans to roast at home, and also the falafel that was my lunch; $10 with a soda and tip), as well as a mix of farmers, fish and meat purveyors, wineries, and artisans outside at the farmers&apos; market. Most people seemed to be local, out to enjoy the warm weather before the hovering thunderheads opened up. Leaving the car I decided to go for a bit of a wander, to see what I could see before the skies opened up. Knowing I couldn&apos;t check into my hotel till 4pm, and feeling fed by falafel and quenched by lemonade, I headed over to visit Forked River Brewing Co. They are located outside of downtown London, and if you&apos;re planning a visit, you will need a way to get there. I drove, but a cab or a bike would work too, as would local buses. They are tucked away in a little industrial complex, but not hard to find. Steve (one of the founders/brewers) showed me around the brewery and talked expansion (more tanks coming in the next few weeks), awards (they got a CBA last year, and are hopeful for more this year), and their event calendar (pretty much every major beer event in Ontario&apos;s Southwest). He served me the gamut of their beers, and I was impressed. Capital Blonde is a solid blonde ale, dry and a little citrusy. Red Coat Canadian red ale was wonderfully balanced, dry and toasty, with just enough hop to give it some bite. Rip Tide Rye Pale Ale shows delicate use of rye, great mouthfeel and just a touch of spice, with a sturdy hop finish. Mojo Citra rhubarb wheat shows hints of tang from the rhubarb and some bright tropicals from the Citra, all of which play well with the slightly tart wheat beer. The retail shop does samples, and sells bottles and growlers, as well as branded merchandise. Riptide RPA is also now available full-time at the LCBO. I was booked to stay at the Station Park All Suite Hotel (242 Pall Mall St, London). It&apos;s centrally located in downtown London, and was walking distance to everywhere I wanted to visit, save for Forked River. I checked-in, parked my car in the garage, and crashed out for a bit to wait out the apocalypse rain. Once the initial onslaught was past, I decided to walk the few hundred metres from my hotel to Toboggan Brewing (585 Richmond St, London). Toboggan is super new (they had only been open three weeks before I visited). It&apos;s an attractive brewpub, serving 8~ beers made on-site, as well as a selection of other craft beers, and some mainline brews. I visited the brewery with Sam Smith, son of the owner and also a brewer there. At 24, he is getting quite the experience brewing with Tom Schmidt (also brewmaster at Spearhead). Given the beers I sampled, I wouldn&apos;t be surprised if he became something of a brewing force in the area. 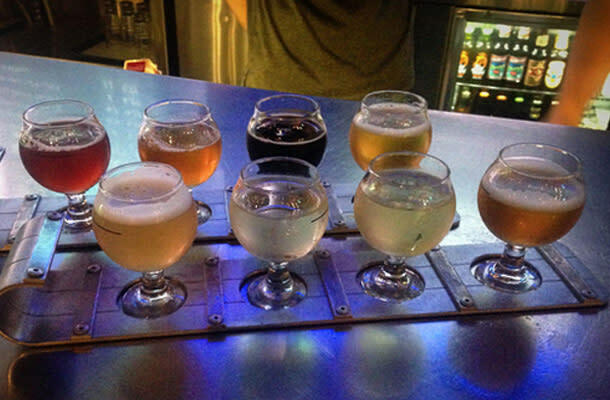 You can get flights in factors of 4 at the bar, served in adorable toboggan glass-holders. I opted to sample all 6 Toboggan beers on draft, as well as their house ciders. The ciders are made in partnership with a local cider maker. The standard cider was nice, and just a bit sweet. Exactly what the average person asking for a cider would be looking for. The Dry Cider was notably drier and tannic. Just a bit of an acidic bite, and some complexity from the apple blend gave it depth beyond its refreshing palate. The beers on offer were their blonde, blueberry wheat, amber, American pale ale, IPA, and stout. The blonde, while Sam assured me was a brew to please the drinkers of the big brewery yellow beer, was so much more. Late hopped with Citra and Amarillo hops, it was tropical and citrusy. The malt was just sweet enough with a bit of honey malt, to give something for the aromatic hops to work against. I was very pleasantly surprised. The Blueberry wheat showed just enough natural blueberry to give some earthy sweetness, which worked very well with the solid, slightly spice wheat ale. Toboggan&apos;s amber is fantastic in its simplicity. Perfectly balanced, toasty and with some spicy hops. The American pale ale shows classic west coast piney hops and snappy dry finish. The IPA is a new world classic, but and bold with a biting hop presence, and solid caramelly maltiness. The stout is big and robust, with big coffee and chocolate aromas. Flights are $7.50/four samples, and with two lovely perch tacos ($5/each), I had a tasty late afternoon meal for $30. And you can hit up their retail store for growlers and howlers (half-sized growlers) of their wonderful beers, as well as the usual selection of branded merchandise. As their main focus is in getting their production up, to keep up with demand in the brewpub, they will not be at as many events as others, but they are in the heart of downtown, and are easy to find, and even easier to remain at. Later in the evening, under a grey drizzle worthy of London&apos;s namesake, I wandered over to Milos&apos; Craft Beer Emporium (420 Talbot St, London), to connect with Milos, and meet an old friend. With 25 draft lines and 2 cask hand-pumps, there is no shortage of beer. And if you&apos;re overwhelmed, the staff know their stuff, and can make excellent recommendations, whether you are just in for a beer, or are having a meal. Most beer is served in 16oz glassware, for $6.50/glass. The exception being very high alcohol beers, which are generally served in 12oz tulips. Milos also has an incredible cellar of bottled beer from some of the finest breweries in Europe, as well as some of the greatest in Canada. While they are renowned for their beer, Milos also takes great pride in his food, which is sourced as much as possible from local producers. I enjoyed their house-made beer nuts ($4.50), and an amazing chickpea burger, topped with pickled turnip, harissa yogurt, and tahini ($13). Match that with a pair of beers and tax and tip, and dinner is still under $40. After that, I was glad to collapse, entirely full of beer and food and good times, into my wonderfully comfortable bed and sleep like the dead. Sunday morning was still grey and damp. I wandered down to The Early Bird (355 Talbot St, London) for breakfast. A funky little diner, The Early Bird is part 1950s diner, part Tiki bar, and part rock music shrine. The hip young staff are friendly and efficient, and quickly I found myself with a cup of coffee and a mountain of decadent french toast, smothered in thyme-poached local berries ($12.95, with coffee tax and tip $20). I then picked up another local friend who was to be my guide out to Sarnia, and for a quick foray across the border into Port Huron, MI. The drive is a straight-forward 60 minutes which gave us time to catch-up. Knowing that we were still a bit early to check out Refined Fool, we popped into Stones and Bones (223 Christina St N, Sarnia), a cool little museum on the main street. We took a quick look around, and I realized that I would have to return later with my little dude, who would go crazy for all the fossils and rocks. We swung through the gift shop for some "sorry daddy was away all weekend" gifts, and headed down to Refined Fool (137 Davis St, Sarnia). Refined Fool is also relatively new, and reminded me a lot of my friends at 5 Paddles. A group of buddies who home-brewed together, and have now found success as a commercial brewery. They don&apos;t pull any punches, and on offer to sample that day was: Chester&apos;s Revenge smoked wheat, The Brouhaha Nut Brown, Antique Peepshow IPA, Joe Sent Me milk stout, One Tax Break Short of a Great Name breakfast stout, Ripsnorter vanilla bourbon porter, and Strike Four quadrupel. Sadly they had just run out of their Noble Oaf rye saison and Short Pier, Long Walk IPA. All are available in 12oz samples for $5.00-6.50, or in sample paddles of four flights for $7. The smoked wheat was interesting, showing lots of good German smoked malt and a nice touch of wheat. The nut brown was the most "simple" and yet was a fantastic brown ale. Roasty and nutty, dry, but balanced. The IPA was not as aggressive as some, but floral and a little tropical. The milk stout was properly sweet and smoky. The breakfast stout was thick with roasty coffee, with just enough malts and hops to keep balanced. The vanilla bourbon porter showed plenty of the promised bourbon qualities, but also some chocolately malty porter notes as well. The quad was jammy and spicy, with a notable alcoholic heat. Their retail store has growlers and bottles available, as well as some merchandise. Needing a refill of coffee before we braved the under-construction bridge to Port Huron, we decided to seek out Alternate Grounds Dockside (97 Seaway Rd, Sarnia). Right on the St Clair River, we found it to be more of a diner, than a coffee shop, and wished we were ready for lunch. We grabbed two coffees for the road and headed towards the bridge. On my friend Paul&apos;s advice, we were heading to two beer shops: Wolverine and Ryan&apos;s Party shop, to pick-up some hard-to-get American beers, then a quick stop at Thumb Coast Brewery for beers and a late lunch. As usual, I was blown away by the selection of beers unheard of in Ontario, just a pleasingly short hop over the river. People who spend time in Sarnia have my envy: in addition to the amazing Refined Fool, they have access to Thumb Coast, and some of the best craft beer from all over the USA less than 10 minutes away. An added bonus: the views of the south end of Lake Huron from the bridge are stunning. I dropped Paul back to his family in time for dinner, and made my way over to the London Ale House (288 Dundas St, London). Part English pub, part sports bar, the London Ale House actually surprised me a bit. The draft line up included some decent beer offerings from Forked River, as well as Mad and Noisy (which yes, is owned by Creemore and by proxy Molson/Coors). They regularly have specials, for instance Sunday evening when I was in, appetizers were half price, sharing plates were 25% off, and you could get a domestic pint and the house-made hamburger for $5 each. If you played your cards right, you could have a very full dinner and a beer and be out for less than $20 tax/tip included. I tried a few of the appetizers, which were mostly predictable bar-food things, but were pleasant, and went well with my Forked River RPA. I was ready for the drive home, but needed to stop in on The King Edward Restaurant & Pub in Ilderton (13239 Ilderton Rd, Ilderton), which is less than a 20 minute drive north of London. 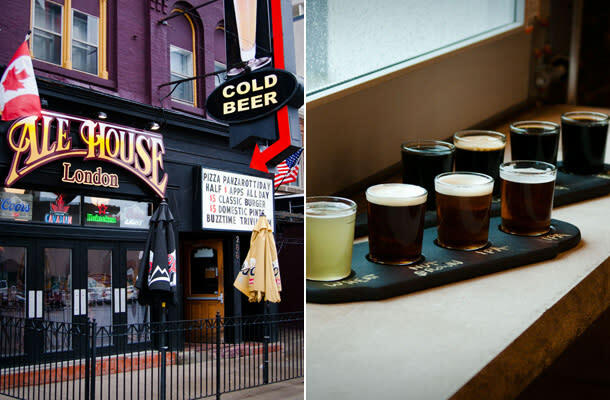 A traditional English pub, they are known at least as far as Toronto for their amazing staff and service, and fantastically well-maintained cask ales. It was worth the diversion, and the pint of MacLean&apos;s IPA was the perfect way to cap a wonderful weekend away. In my adult life, I&apos;ve nearly always weekended north (in cottage country), or else east (cottages or Ottawa area). I must confess I&apos;ve rather missed out. The whole area of Ontario&apos;s Southwest is wonderful. London and Sarnia are fun towns to hang out in. There are more country spots than just The King Edward in Ilderton to explore, and of course, Stratford and their amazing dramatic festival are not far away. And if the three breweries I visited are any indication, we can expect more good things in terms of beer from the region. I will most certainly be back, sooner, rather than later. Chris Schryer is a Toronto-based beer writer and educator. He founded TorontoBeerBlog.com and the Toronto Beer Podcast, and has been featured in print/radio/TV on every continent save Antarctica. You can find him on Facebook, Twitter and Instagram sharing his latest craft-beer discoveries and opinions.